Candidates representing diverse communities scored key wins last night. Tuesday’s midterm election results are full of firsts. More than 100 women, an unprecedented number, were elected to the House and Senat as first-time female candidates swept one race after another. In 18 races (some remain to be called), Democratic women flipped formerly Republican House seats, often by beating out male challengers. The night also ushered in a flock of diverse victors, from the first Native American women to be elected to congress, to Texas’s first Latina congresswomen, to the country’s very first female-majority legislature, on the island of Guam. 1) Connecticut’s first black woman elected to Congress: Jahana Hayes. A political newcomer, Hayes is a longtime educator who was designated 2016’s National Teacher of the Year. In her campaign in Connecticut’s 5th district against Republican Manny Santos, Hayes didn’t shy away from talking about details of her background that would make her an unconventional representative in the predominantly white and male Congress, including having been raised by her grandmother in public housing in a poor neighborhood, and having a baby at 17. 2) First Muslim women elected to Congress: Ilhan Omar and Rashida Tlaib. Formerly members of the Minnesota House of Representative and the Michigan House, respectively, Omar and Tlaib became the first Muslim women elected to Congress—Tlaib from Michigan’s 13th congressional district, and Omar from Minnesota’s 5th. Omar is also the first Somali-American elected to Congress. 3) Massachusetts’s first black woman elected to Congress: Ayanna Pressley. As the first African-American woman elected to Boston’s City Council, Pressley, 44, ran unopposed in Massachusetts’s 7th congressional district, following her primary defeat of 10-term incumbent Michael Capuano this summer. In a speech to supporters on Tuesday night, she noted the historic nature of her win: “Can a congresswoman wear her hair in braids? Rock a black leather jacket?” she said, to cheers from the audience. 4) New Mexico’s first Democratic Latina governor: Rep. Michelle Lujan Grisham. A three-term congresswoman and the outgoing chair of the Congressional Hispanic Caucus, attorney Lujan Girsham beat out Republican Rep. Steve Pearce for the right to lead the state of New Mexico. She’ll replace Republican Governor Susanna Martinez, the country’s first Latina to win a state governorship. 6) New York’s first black female statewide official: Letitia James. James is no stranger to making electoral history: In 2013, she became the first black woman to win citywide office in New York City when she became public advocate. She won her race on Tuesday, becoming New York’s first black attorney general, with more than 80 percent of the vote. As attorney general, James has promised to crack down on Trump’s “constitutional abuses” and “shady business practices” in New York. 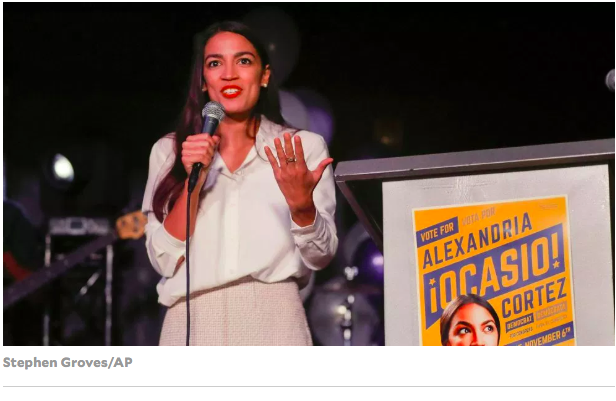 7) Youngest woman elected to Congress: Alexandria Ocasio Cortez.Democrat and Bronx resident Ocasio Cortez catapulted onto the national stage when she beat 10-term incumbent Rep. Joseph Crowley in a summer primary, just months after leaving her job as a bartender. On Tuesday, the former Bernie Sanders campaign organizer sailed to victory in New York’s 14th congressional district, where about half of residents are immigrants. 8) Iowa’s first women elected to the House of Representatives: Cindy Axne and Abby Finkenauer. Democrats Axne and Finkenauer both triumphed over Republican incumbents: Axne took on Rep. David Young in the 3rd congressional district, while Finkenauer defeated Rep. Rod Blum in the state’s 1st district. Before this race, Axne was a newcomer to politics, but had worked in state government on environmental policy under former Iowa governor Chet Culver. The 29-year-old Finkenauer had served in the Iowa legislature since 2015 and on Tuesday also became the second youngest women elected to Congress after Ocasio Cortez. 10) Massachusetts’s first black district attorney: Rachael Rollins. The Democrat and Cambridge-native handily beat her opponent on Tuesday to become the top prosecutor in Boston’s Suffolk County. Rollins, who has served as a prosecutor in the US Attorney’s office, ran on a progressive criminal justice reform platform. 11) Guam’s first female governor and the United States’ first female-majority legislature: Lou Leon Guerrero won the governorship in Guam on Tuesday and celebrated by dancing the electric slide. Along with her, 10 women were elected to Guam’s 15-member legislature, making the island the first US state or territory to ever elect a legislature where women outnumber men. 12) Maine’s first female governor: Janet Mills. Mills has cracked several glass ceilings for women in Maine over three decades: she was elected the state’s first female district attorney in 1980, and later became the first female attorney general. Mills won a competitive race Tuesday against Republican businessman Shawn Moody, and will replace a Republican governor Paul LePage. 13) First Latina congresswomen from Texas: Veronica Escobar and Sylvia Garcia. Escobar, a former county commissioner and county judge in El Paso, won the state’s 16th congressional district while Garcia, a current member of the Texas state senate, won the 29th. Both won their races against Republican challengers with large margins. 15) First openly gay man elected governor: Jared Polis. In 2008, Polis became the first openly gay man elected to the US House of Representatives as a congressman from Colorado. On Tuesday, the Democrat won the race to become Colorado’s governor, once again setting an LGBT legislative record. 16) South Dakota’s first female governor: Rep. Kristi Noem. In a nail-bitingly close race, the Republican Noem, a four term US congresswoman who previously served in the South Dakota legislature, narrowly defeated her Democratic challenger, Billie Sutton. Noem is a staunch conservative: an opponent of abortion and sanctuary cities who’s voted to cut government spending and to repeal Obamacare. 17) Tennessee’s first female senator: Rep. Marsha Blackburn. An eight term congresswoman, Blackburn is a self-identified “card-carrying conservative” on issues like abortion and gun control. She beat out former Tennessee governor Phil Bredesen, a Democrat, after running a campaign that highlighted her alignment with President Donald Trump, who won Tennessee in the 2016 election. 18) New York’s first DREAMer elected to public office: Catalina Cruz. A Democrat and former housing attorney, Cruz came to the United Statesfrom Colombia at age 9 without papers; she only gained citizenship after marrying her husband in 2009. On Tuesday, she won her race for New York’s 39th Assembly District, defeating the incumbent Democrat and another candidate, and becoming only the third Dreamer ever to win public office nationwide.